What does financial independence mean to you? To most people, being financially independent means you can maintain your desired lifestyle without relying on a regular paycheck. Most people compare it to retirement but you can be financially free and still work and keep busy although you’ll just be doing it because you want to and not because you have to. There’s the major difference. So how does one get to the point in their life where they can still have expenses and not need a job? Well, the short answer is that most people build up enough savings to sustain their lifestyle for several years. There is more than one way to do this though which makes it very possible for most people to become financially independent one day. Here’s how you can gain financial independence for yourself. Financial independence is a privilege and an option most people don’t feel they have. Why? I’ll bet the people who are struggling living paycheck to paycheck feel that they can’t reach financial independence and they’re right. You’ll never become financially independent if your bills almost match your income or even exceed it. In order to stash lots of money away so you don’t have to work in the future, you need to have a sizeable surplus. Keeping your expenses low will almost ensure you’ll have extra money left over to save and invest. To do this, start by getting your priorities straight. Determine what is important for you to spend a lot of money on and what isn’t. For us, it’s important that we spend money on private school for our son, but we don’t spend much on dining out, living expenses, clothes, or entertainment so we are able to spend less than we earn and save the difference. This isn’t required to reach financial independence, but it can help significantly. If you want to inflate your lifestyle, you’ll need to significantly inflate your income first. For example, someone who earns $40,000/year won’t have the same opportunity to save as much as someone who earns $100,000/year no matter how frugal you are. If the person earning $40,000 annually stretches their budget and manages to save $20,000 each year, that would be an awesome accomplishment. However, the person making $100,000 can afford to save $40,000 each year or even more if they decide to keep expenses low. Plus, they can also live more comfortably in the meantime so it’s a win-win. You don’t have to be a six-figure earner to reach financial independence. However, it will be an easier journey if you commit to making more money. You can negotiate raises each year at your job or go after a promotion. You can also develop some new skills that you can market for a higher paying job. Or you can find a flexible way to make money on the side or start a side business. Bottom line, if your income hasn’t noticeably increased in the past 3 years, it’s time to make a change and start making money. For example, you can set a goal to increase your income by $10,000 each year. When you break that down, that’s $833.33 per month that you need to earn by taking the various steps mentioned above. Keep in mind that your income doesn’t have to come from one source. Most people who are financially independent have multiple streams of income so that’s what you need to establish as well. You won’t be able to gain financial independence for yourself if you continue to hold onto debt. Debt holds you back in so many ways but it will prevent you from reaching your biggest financial goals. Debt is a result of overspending and as long as you have it, it’s evidence that you haven’t gotten ahold of your spending problem. Develop a plan to get out of debt by a certain date and change your spending habits so you can stay debt free. If your goal seems too big, break it up into smaller chunks. When I first decided to pay off $30,000 of debt I was very overwhelmed. Then, I made the goal smaller and paid off $11,000 of debt during the first year using the avalanche method. As you pay off your debt, you should also be building a small emergency fund to cover unexpected expenses. Once you’re debt free, continuing piling money into your emergency fund account so it will be available when you need it so you won’t have to get back into debt. Remember that living debt free is a lifestyle which means you’ll no longer make your purchasing decisions based on monthly payments plans and interest rates. It feels better to pay for things with the cash you have anyway. As I said initially, saving money is the short answer when it comes to reaching financial independence. You need to save enough in order to prepare your finances so you can fund your lifestyle even after you receive a regular income. How much you save all depends on what you want your lifestyle to be like. The best way to find out is to determine how much money you can see yourself living on once you become financially independent. Is it $30,000/yr? $40,000/yr? or $60,000/yr? Whatever amount you come up with, take that number and multiply it by 25. That’s likely how much you need to become financially independent. So if you said you wanted to live on $40,000/yr, you’ll need to have around $1,000,000 saved. Now, I know that sounds like such a steep number, but you also want to consider any streams of income you have coming in when you decide to become financially independent. Will you be old enough to receive some social security benefits? If you prefer to be financially independent way before that, figure out if you can develop some passive streams of income to help sustain your lifestyle. For example, if you can earn $1,000/month in passive income and $500/month in rental income, that’s $1,500/month or $18,000 per year. You’d then only need $22,000/year from your savings. One of the best ways to grow your savings significantly is to invest and start early. Investing early will allow enough time for compound interest to work its magic and give you a nice return on your money while building your nest egg. You can also increase your savings rate too. This is why most people who want to become financially independent start saving 50% or more of their income so they can reach it sooner. Imagine if you focused on making more money each year and invested and saved a generous portion of it? You could become financially independent in just 10 to 20 years instead of having to wait 30 to 40+ years like most people. Now, I’d love to hear your thoughts on financial independence. 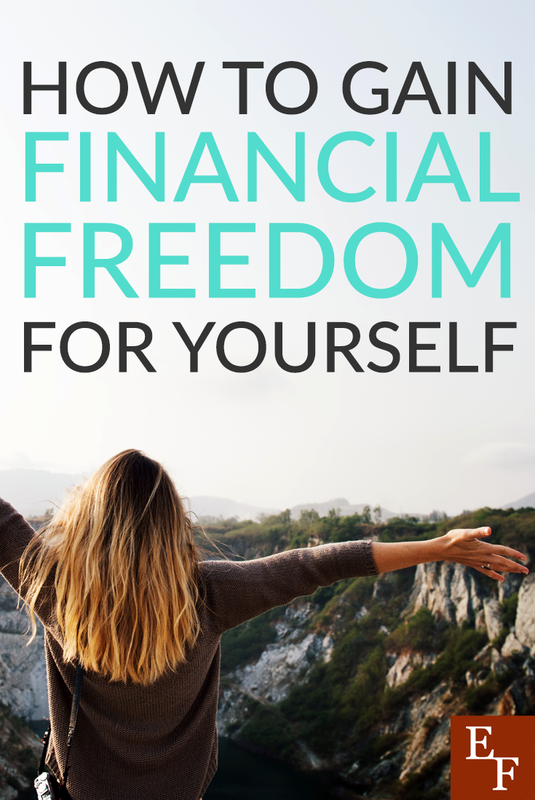 Do you think you could gain financial independence for yourself? How would you go about it and what obstacles would you have to overcome? The real key to financial independence is to spend less than you earn. Avoiding consumer debt and ignoring the Joneses will get you most of the way there, but it takes a lot of diligence to spend much less than you earn. Good explanation about financial independence, thanks for sharing. providing No credit check loans for personal use on a quick basis.